Dolores Canning Co., Inc. is a Los Angeles based family firm specializing in Quality Mexican Food Products. Originally founded in 1954 as a distributor of Beef & Pork products, our line includes our famous “Chili Brick” (offered in all Beef, all Chicken or our new Vegetarian/Gluten Free version). 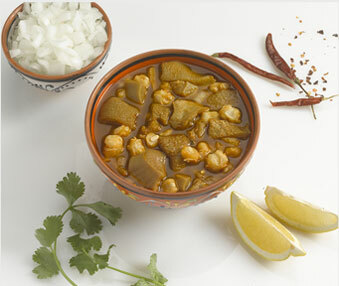 We also produce a line of Mexican grocery items (Pickled Pork products), Heat & Serve Soups (Menudo & Pozole) as well as a substantial amount of Private Label products. All products are offered in Retail & Foodservice packaging. 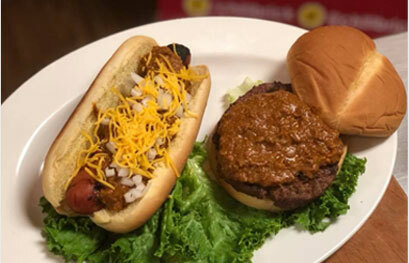 There’s only one real “Chili Brick®”, it’s our trademark name! Our all Beef Chili Brick® is fully cooked, packed hot and then frozen in the shape of…you guessed it, a Brick! We’ve been making our famous Chili Brick® since 1954 and we ship it to countless retail stores and foodservice accounts throughout the West Coast. All our Chili Brick flavors provide great value, simply add water or beans to create your desired consistency! 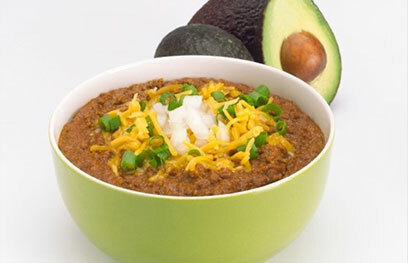 Looking for a leaner option for your Chili? 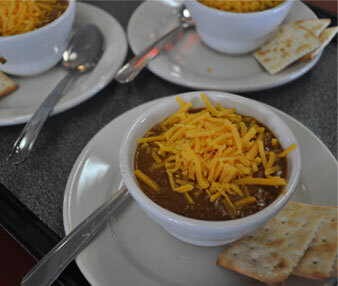 Try our 100% Chicken Chili. 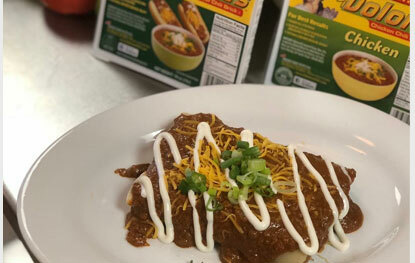 It’s made with the same great family recipe and is sold side by side with the Beef Chili at retail meat departments and many well-known foodservice accounts. Simply add water or beans to create your desired consistency! 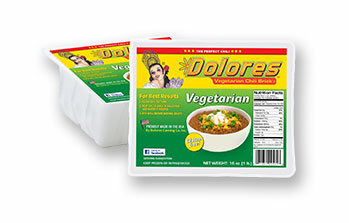 Our newest product, Vegetarian & Gluten Free Chili, provides the same great “Dolores” taste. It’s so good, you won’t believe it’s Vegetarian! Like all our Chili Brick® flavors, you will need to add water or beans to reach your desired consistency! 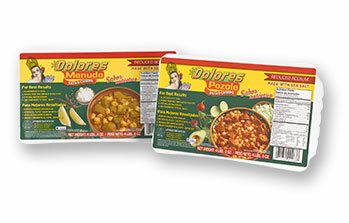 Dolores Canning Co., Inc. has made Menudo & Pozole since 1954, and although we stopped selling canned products about 20 years ago, we continued to make a superior alternative for restaurants and foodservice accounts. We are now introducing our retail pack, a 4.5# tray. 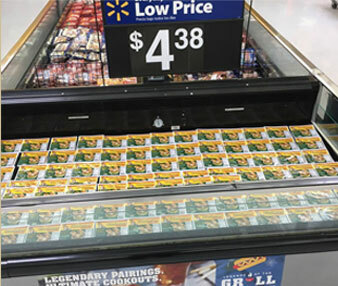 This product is sold frozen, not in a can! It is now being offered at select retailers throughout Southern California. 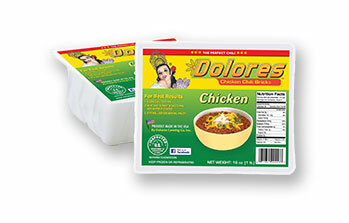 At Dolores Canning Co., we are committed to producing safe, healthy food. 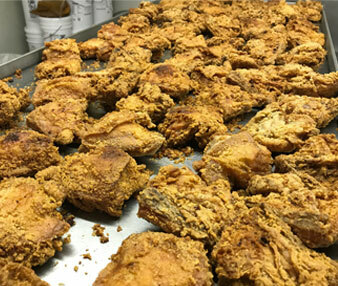 Our company has programs, processes and technology in place covering all aspects of food safety, from the farm to our processing facility and even to the consumer. We also employ food safety & quality control staff that work with our plant and regulators to monitor the effectiveness of our efforts. 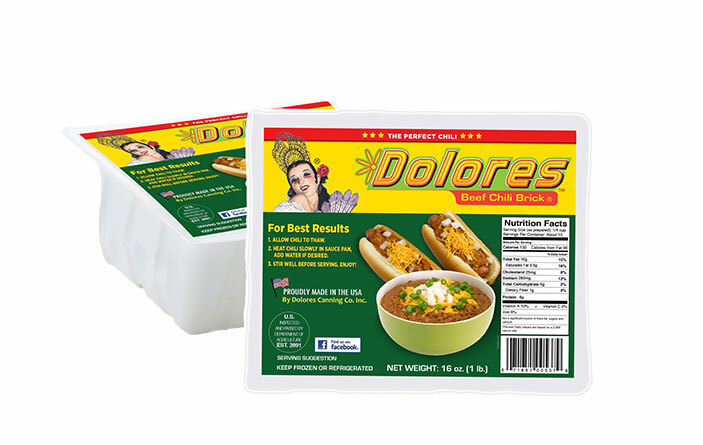 Dolores Canning also uses certified outside labs for all food safety testing and research. Our Dolores Canning plant is federally inspected daily by USDA Inspectors and we conduct annual 3rd Party Food Safety Audits. Prepared Chili Brick® is delicious by itself or topped with any of the following: shredded cheese, onions, tomatoes, sour cream.